The research aimed to assess the social costs associated with gambling in Victoria in financial terms. Phase one of the study reviewed previous attempts to quantify the cost of gambling. Because previous studies mainly excluded low-risk and moderate-risk gamblers, and costs tended to focus only on people experiencing severe levels of harm (using the Problem Gambling Severity Index) – this study broadened the calculation to include all gambling severity levels: low-risk, moderate-risk and problem gambling. The second phase of the study estimated the costs of gambling to Victoria for all severity levels. It was found that when low-risk and moderate-risk categories were included, the cost of gambling in Victoria in 2014-15 totalled $7 billion, as compared to a previous figure of $2.4 billion when including only the more severe, but less prevalent, problem gambling group. $100 million – costs of crime, including to businesses and the justice system. 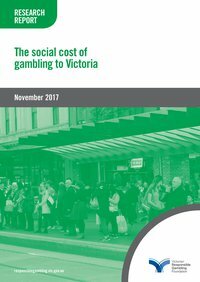 Browne, M, Greer, N, Armstrong, T, Doran, C, Kinchin, I, Langham, E & Rockloff, M 2017, The social cost of gambling to Victoria, Victorian Responsible Gambling Foundation, Melbourne.